Cottage fronte oceano con 200 piedi di spiaggia privata di ciottoli con splendida vista sulla baia occidentale e sulle montagne del Parco nazionale di Acadia. Situato su 3/4 acri, questo cottage è situato in una posizione tranquilla, boscosa, a soli 10 miglia a Acadia National Park e 12 miglia a Bar Harbor. Cottage dispone di 2 camere da letto, soggiorno, bagno, cucina con elettrodomestici moderni e piccola veranda per la colazione. Dalla veranda o dal ponte, goditi l'alba sulle montagne o la bellezza della luce lunare sull'acqua. Servizi: riscaldamento elettrico, stufa a legna, telefono. Si prega di No Animali domestici. Vietato fumare. Attività: nuotare, andare in kayak, camminare, andare in bicicletta o semplicemente sedersi e leggere un libro sulla spiaggia privata. Area: convenientemente situato tra Ellsworth e Bar Harbor, direttamente sulla riva. Pranzo, shopping, orologi di balene, crociere nella natura, escursioni a piedi o in bicicletta nel Parco nazionale di Acadia. Lenzuola e asciugamani non sono inclusi nella tariffa di noleggio. Tuttavia, possono essere forniti a costi aggiuntivi modesti per gli ospiti che non possono portarli da soli. My wife and I stayed here for 4 nights and absolutely loved it. The cabin was very quaint and felt like home. While it was cold outside, the wood stove and other heaters kept us quite toasty. It had all the amenities we needed, and we loved the authentic experience. Pat and Bob were extremely gracious every step of the way and bent over backwards to ensure we were comfortable and taken care of. The lake view is fantastic and cabin is in a wonderful location. You can’t ask for a much better cabin getaway. Thanks so much to our fall guests for their nice review. We just want to mention that the cottage is direct ocean front (not lake front) on Western Bay. If you are lucky you may see a seal out in the bay at high tide. Across the bay is a view of Cadillac Mountain in Acadia National Park. Pat and Bob are gracious hosts who provide all the info and amenities you need for a wonderful stay. It is hard to leave the water view in the morning and a delight to return at night and start up the wood stove for a cozy night. Nice view. Pretty dirty. Might as well stayed at hotel for the price. My husband and I are very disappointed in this review and would like to give future potential guests some background on this particular rental. The three gentlemen who rented the cottage claim that it was dirty but never mentioned this upon arrival. I will say it was very dirty upon their departure, so much so that the cleaning people who check and clean before every new guest called and told me about it. If it were simply a matter of forgetting to take out the trash, that is simple to remedy. But in this case it was so dirty that the cleaning people had to spend extra time to get it into good shape for the next guests. In consequence of these three gentlemen not cleaning at all, in spite of this requirement being clearly spelled out in the lease they signed, and in the conditions of rental on the VRBO/HomeAway website, we deducted a very modest cleaning fee of $35 from their security deposit. Also spelled out on the website is that guests may request to pay a cleaning fee and all will be taken care of for them. Most guests prefer to clean and avoid a cleaning fee. As it was, the amount we charged was much less than the amount of cleaning we had to pay for after they left. Another point that I would like to make is that we provided sheets and towels for three people and three beds at the request of this guest and told him the charge would be $25 per bed for a total of $75. In calculating their final payment I neglected to add this fee, but since it was my mistake, I did not seek to rectify it later, a fact I mentioned to the guests. So I find it a bit disingenuous to complain that they had to bring linens when in fact we provided them to them at no cost, albeit by mistake. In regard to it being cold, the most recent guests in mid October, who had colder weather, remark on how toasty warm it was with the wood stove and the electric heat. In regard to the other comments about the cottage being uninsulated, that is true. We make no attempt to disguise that fact and I think our photos show that this is indeed a rustic Maine cabin with beautiful views in a peaceful ocean front setting. This guest suggests you should rent a hotel room for the same price. I am not sure where in the Bar Harbor area you can get a hotel room at this price on the ocean, with 2 bedrooms, a living room, full kitchen, and sunporch overlooking the water, but if you can, and you would prefer that type of accommodation, then certainly I would recommend that as an option. We loved this quaint little cottage on the ocean! We had a great time on this week long getaway. Cozy cottage. Beautiful view out the back porch window while we ate breakfast! My kids loved looking for shells and sea glass on the beach. There’s nothing better than having the ocean in the backyard! The cottage was well stocked with everything we needed. We would recommend this cottage to anyone and would definitely stay again! The cottage was charming and spotless. The atmosphere tranquil and Acadia was breathtaking. My husband and I had a beautiful time in the picturesque cabin. The sun porch allowed nature watching at its best: calm water, birds, ducks, seagulls. Morning coffee there was a lovely start to each day. Great location. 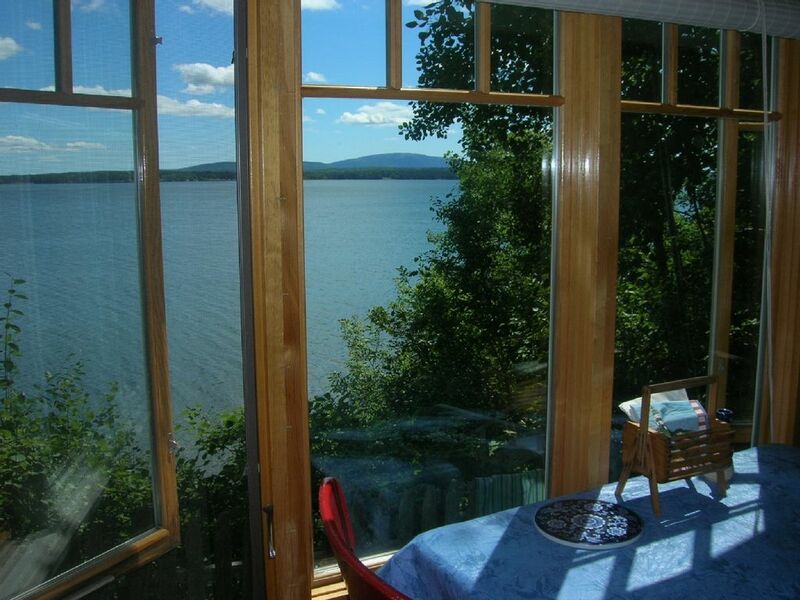 Close to Acadia and Bar Harbor, Yet a private water front setting. Great location. Great views. Secluded, private setting. Yet close to Mt. Desert Island and all of its attractions. Cottage is comfortable and we'll equipped.